Your search has come to a successful conclusion if you have been trying to identify a reliable electrician in Coral Springs, Florida. MMJ Electric sets the standard in this area for top quality installations and electrical repairs at prices that are more than fair. We have many years of experience, and all of our team members are dedicated professionals that take a lot of pride in the work that they do. Coral Springs is a city that has grown by leaps and bounds over recent decades, because people are attracted to the very high quality of life. In fact, it has been recognized on multiple occasions as one of the best places to live in Florida. We know the city well, and we can say with certainty that the praise is warranted. We provide rapid responses to calls for electrical repairs in the Coral Ridge Drive/Wiles Road section, City Center, the Royal Palm Boulevard/Brittany Court area, and all other parts of town. 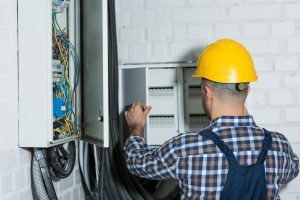 The bottom line is this: whenever you need an electrical contractor in Coral Springs, Florida, help will be just a phone call away. If you are fortunate enough to own residential property in this area, you are invariably going to need an electrician from time to time. We can be called upon to perform any and all types of electrical repairs, and we prioritize emergency situations. Our electricians also install indoor lighting, outdoor lighting including LED lights, ceiling fans, and whole home automation systems. In addition to the electrical repairs and installations that we provide for individual homeowners, we are commercial electrical contractors. We have experience working on all different types of commercial structures, and we have the equipment and the expertise that it takes to handle challenging assignments. Every business should be concerned about the potential impact of a devastating fire. To protect yourself, you should have a fire alarm system professionally installed, and this is one of our areas of specialization. Plus, we offer fire alarm monitoring around-the-clock, so we provide turnkey fire prevention solutions. Electrical Repairs with MMJ Electric! Whenever you need us, we will be ready to spring into action to provide fast, efficient, and effective electrical repairs in Coral Springs, Florida. You can get in touch with us by phone at 954-876-1536, and there is a contact form on this website that you can use to send us a message.